The rupee on Monday ended lower by 27 paise to more than 2-week low of 67.35 against the American currency on month-end dollar demand from importers in spite of sharp rise in the domestic equity market. 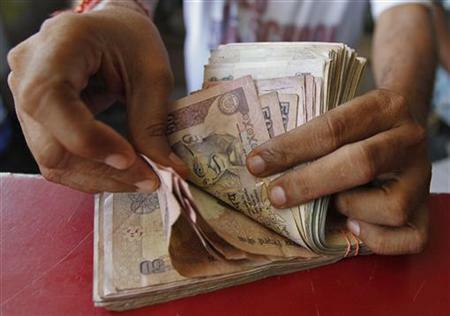 Good foreign capital inflows failed to restrict the rupee's fall against the dollar, a forex dealer said. The rupee opened lower at 67.19 as against the last Friday's closing level of 67.08 at the Interbank Foreign Exchange market and dropped further to 67.36 before ending at more than 2-week low at 67.35 per dollar. The rupee had last ended at 67.37 on July 8, 2016. The domestic unit hovered in a range of 67.36 and 67.16 per dollar during the day. The dollar index was trading down by 0.04 per cent in the late afternoon trade. Meanwhile, the RBI fixed the reference rate for the dollar at 67.2430 and euro at 73.7992. In cross-currency trades, the rupee dropped against the pound sterling to close at 88.41 from 87.90 previously and fell against the the euro to settle at 73.97 compared to 73.91 previously. The domestic currency also dropped against the Japanese yen to 63.38 per 100 yens from 63.22. Pramit Brahmbhatt of Veracity Financial Services said, "Despite of strong cues from domestic equity market, we observed the rupee depreciating against dollar. Nifty traded with positive bias in today's trading session and gained 95 points to give a close at 8,636 levels. Thus to end the session, the rupee depreciated by 27 paise and closed at 67.35/USD. Trading range for the spot USD/INR pair will be 67 to 67.50/USD." In overseas market, the dollar was buoyant against the yen and euro in the early trade today as the risk-on mood inspired by solid US economic data and fading fallout from Brexit continued to lift the US currency and assets. In the afternoon, the yen was almost flat against its rival currencies during Asian trade today, with investors reluctant to move aggressively ahead of the monetary policy meetings in the US and Japan later this week. Investors are expected to largely sit on the sidelines before the Federal Open Market Committee on July 26-27 and the Bank of Japan's policy setting meeting on July 28-29. In the forward market, premium for dollar eased further on sustained receivings from exporters. The benchmark six-month premium for December moved down to 172-174 paise from 174-176 paise on last Friday and forward June 2017 contract also dropped to 369-371 paise from 371-373 paise. Oil prices dipped today, extending last week's losses on fresh worries about a global supply glut as more US rigs come back online and the dollar strengthens. US benchmark West Texas Intermediate was down six cents at $44.13 a barrel and Brent was also six cents lower at $45.63. The benchmark Sensex rose by 292.10 points or 1.05 per cent to close at 28,095.34.